iDancehallReggae.com::Caribbean Lifestyle Media::: DENYQUE: Torn to Pieces? Leaving us for a few months, we "Can't Breathe" without her Kryptonite, DENYQUE is back with a hot new single called "PIECES" on the Feminine Riddim by Platinum Producer Donovan 'Vendetta' Bennett of Don Corleon Records (Sean Paul feat. Keyshia Cole - Give It Up To Me). The song was premiered on Friday October 16, 2009 at approximatly 1:00pm to an overwhelming response, answering her many fans, friends and critiques who have been wondering what has happened to the "Supεяwomαn". 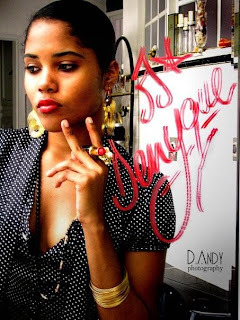 Still with her "S" on her chest, DENYQUE's song "PIECES" received about 5 pull ups from Zj Liquid on it's premiere. The song was also played prior to Liquid coming on air and after Liquid... came Zj Chrome who also played the song. The song has been getting heavy rotations ever since on all major radio stations such as Zip 103 FM, Fame FM, and Irie FM. DENYQUE has also landed a campaigning deal... so look out for that soon, trust me.. BIG things are happening for the "Supεяwomαn". Another single scheduled to be released soon is called "STRUT" by UIM Productions.